The coronation of George IV, on July 19, 1821, was the occasion for great celebrations across Britain. This had I think less to do with the fact that the Prince Regent was now crowned king, than the fact that free food and drink--and a holiday--were available in virtually every town in the kingdom. Newcastle upon Tyne in the north-east of England was no exception. Celebrations began early in the morning and, through a variety of causes, ended in riot. One of the key areas of celebration was the Sandhill. This is a roughly triangular piece of land, near Bridge Street, almost on the bank of the river. Long a market 'square' it was a centre of the town's activities. Here, for the celebration of the coronation, a wine pant was set up. A 'pant' is a fountain; the word is from the dialects of Scotland and north-east England. There were several pants set up in Newcastle for the celebrations. Two beer pants were erected--one at the Old Flesh Market, and one at the Milk Market and possibly a third at the Spital. But especially notable was the large wine fountain at the Sandhill. The Gentlemen of the City corporation--the mayor, the sheriff, aldermen, etc.--made speeches, then attended at St. Nicholas Church for a celebratory service. After that they were to process to the wine pant, and salute the new sovereign with a toast and drink his majesty's health. They couldn't get to it. The crowd was so immense, and immediately became so rowdy that the gentlemen retired in short order. "An indescribable scene of the most indecent uproar ensued..." according to one report. The wine ceased to flow, and the elegant pant was torn to pieces. 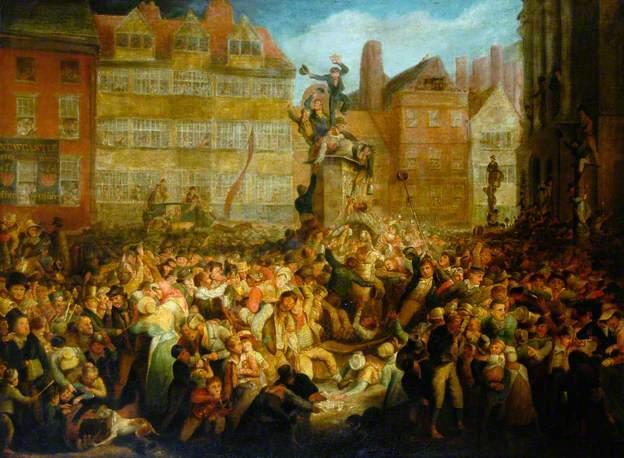 In other parts of the city the ale-pants were likewise the scenes of mayhem. Ox roasts nearby them also deteriorated into riots. Note the error above in the year--1819 instead of 1821. These two songs were collected in an edition called "Allan's illustrated edition of Tyneside Songs and readings". It was published in 1891 and the events of seventy years before were already remote. The mention of Caroline, George's unloved queen is interesting--Newcastle had come out in support of the king's lawful wife the year before his coronation. As we celebrate the birth of another George, already king-in-waiting, it is interesting, as always, to reflect on the events of the Regency and reign of George IV. As a writer of historical fiction, I have often wished for time travel. Oh, to be able to go back--to see what it was really like--to feel and see and smell my favourite era, even just for a moment. But it cannot be, and so I research and recreate, to the best of my abilities. Once in a while, I uncover something that strongly evokes the period about which I am writing. London's Summer Morning is one such piece. London at the end of the 18th century is so well defined, so thoughtfully illustrated, it seems possible for me to walk those streets. The poem was written by Mary Robinson. The exact date is not known, but she died in 1800. This is the same Mary Robinson who was a famed actress and mistress of the Prince of Wales (later Prince Regent). She was renowned as "Perdita" from The Winter's Tale and, via caricature, he became her "Florizel". Mary Robinson was a writer before she became an actress, and continued to write after her acting career ended, and illness disabled her. She wrote novels, plays and feminist works, and eventually came to be called "the English Sappho". Her life and loves, her support of the rights of women, and of the French Revolution, have been well documented in biographies and treatises. But it is this one poem that interests me most. For in this one poem, we can walk at her side down the streets of London on a hot summer's morning--more than two hundred years ago. The Victorian era was noted for its pious, virtuous, and sometimes stultifying charitable attitudes and societies. But the philanthropic leanings of British society had begun much earlier--at least as early as 1800. The Regency period was well supplied with charities needing financial support and volunteers. 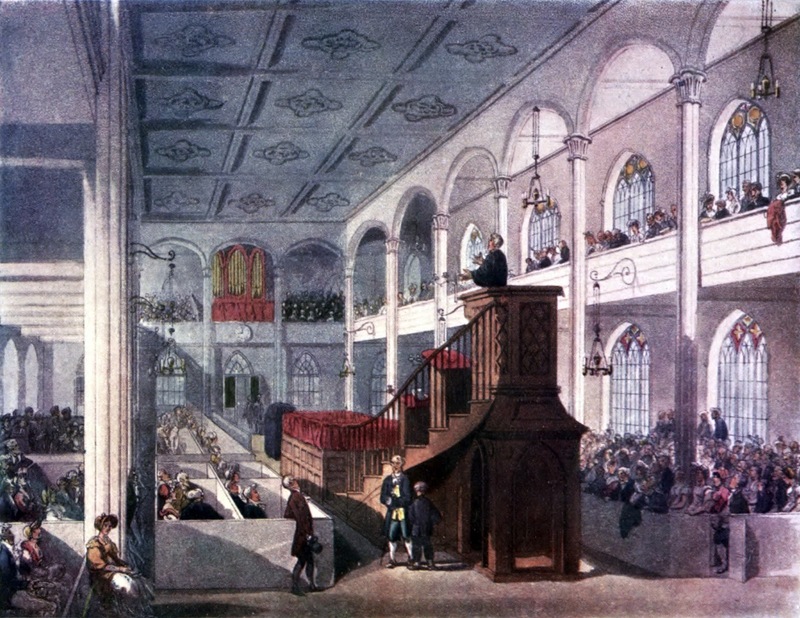 In 1823 there were more than fifty societies for "the relief of the distressed" listed in "The Annual Subscription Charities and Public Societies" publication. The Philanthropic Society at Mile-End was one of those listed. A publication of 1812 called The Philanthropist: or Repository for Hints and Suggestions calculated to promote the Comfort and Happiness of Man gives a clear picture of the organization of the society. An annual subscription to the Society was twelve shillings, although any donation was welcome. Five guineas made the donor a life subscriber. There were eighteen directors of the Society, a president chosen from them, and a treasurer and a secretary as well. To become a director of the Society was no sinecure. The Philanthropist gives a description of their activities. The last sentences are particularly telling--the directors met every Saturday. The monies collected and disbursed were significant. From February 1811 to February 1812, the Society held some 858 pounds. It disbursed, directly to those in need (mainly those leaving prison and their families), about 767 pounds. At the time of the report in The Philanthropist, the Society calculated that since its founding in 1803 it had aided just over 10,000 people. There was no doubt that the Mile End Philanthropic Society fulfilled a need. It can be confused with its much larger associate of the same name, The Philanthropic Society, founded in 1788, for "The Promotion of Industry, and the Reform of the Criminal Poor". By the early 1800's this Philanthropic Society had a very high--and fashionable--profile, with schools, factories and residences in its purview, working mainly in St. George's Fields south of the Thames. It also maintained a Chapel, the collections from which provided a great deal of the income of the Society. There was work to be done and help needed throughout all strata of society. The Victorians weren't the only ones to realize it. The good folk of the Regency, and their parents in the 18th century, were organizing assistance and donating their money well before Victoria took the throne. Jane Austen knew it. So did Georgette Heyer. 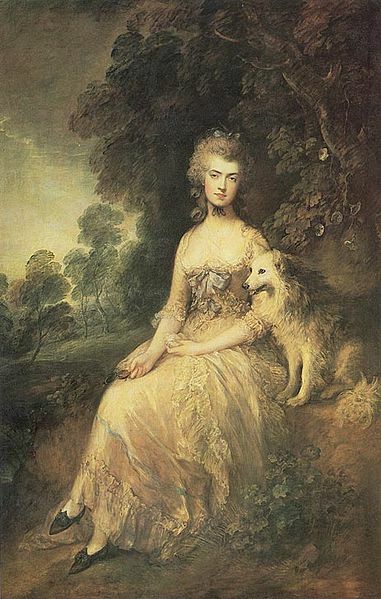 She had one of Regency fiction's most delightful philanthropists in her book The Nonesuch. Charity certainly has a place in Regency fiction. We've all read of the lobster patties eaten at the suppers provided at balls. Sometimes it seems that the only item of food is the lobster patty. But period cookery books show that the food for the ball supper was taken very seriously, and was extensive. The plate below is from The Housekeeper's Instructor of 1805. I am not sure why it indicates a 'ball supper for twenty people'. Certainly the amount of food shown would provide for many more people than twenty. In the first plate, 'desert' is displayed in the lower part of the illustration. Below is another illustration of confectionary for the ball supper. This plate comes from The Complete Confectioner of 1819. A book titled The Practical Confectioner, published in 1822, apparently has complete bills of fare for ball-suppers. I've not been able to locate a copy of this book; I'd love to have a look at it. The above mention and review is from The Monthly Review for 1822. Next time my characters are at a ball and feeling rather peckish, they will be eating fricandeau and marangles rather than lobster patties!